This 3D perspective view is a composite of both HiRISE and data from CRISM, another instrument onboard MRO. This view covers a small patch of ancient Martian real estate in Terra Sirenum. CRISM collects spectral data that can be used as a chemical fingerprint for the upper most surface. 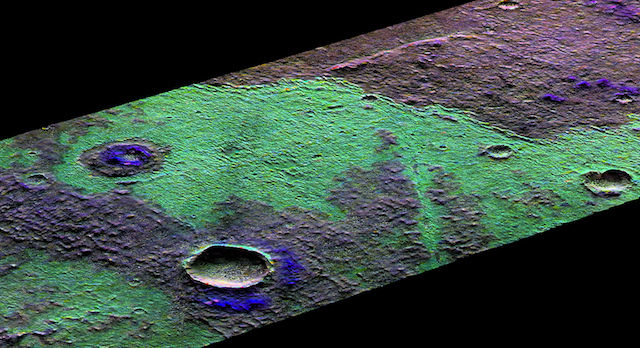 This information suggests that this small patch of surface is covered with salts (chlorides) represented in green and water-rich clays that appear in blue. This entry was posted in Reports and tagged clay minerals, clays, Compact Reconnaissance Imaging Spectrometer for Mars, CRISM, High Resolution Imaging Science Experiment, HiRISE, Mars Reconnaissance Orbiter, MRO, NASA, phyllosilicates, salts, Terra Sirenum, University of Arizona. Bookmark the permalink.